Installed on the back of each front seat, these allow you to set down objects and each is equipped with a cup holder. To use the table, raise it fully until it locks in the high position. To store the table, lower it, passing the point of resistance, to the low position. 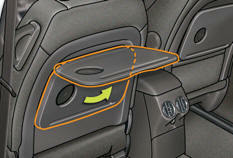 On the passenger side, do not forget to fold the "aircraft" type table before placing the seat in the table position. Do not place hard or heavy objects on the table. They could become dangerous projectiles in the event of emergency braking or impact.